The Herschel Hoard is pleased to welcome another 1 of 1 card. 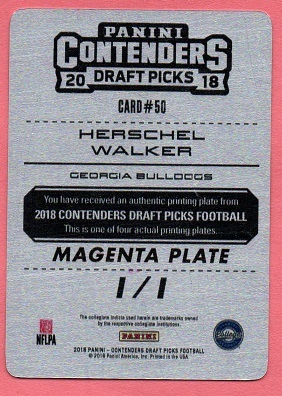 This time, it's a Magenta version of the Panini Contenders Draft Picks set. A funny thing I noticed while reviewing this blog. 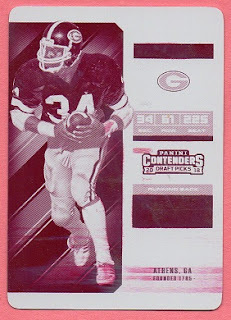 I made an entry in February 2017, in which I noted that the Trading Card Database had a total of 800 cards listed for Herschel Walker, of which I had 571. I also noted that several of those cards listed were printing plates, and that, "I'd never get any of those." Today, the TCDB lists 936 cards for Walker, and I have 673 in my collection. In addition, the printing plates are no longer an impossible dream. You just need persistence and a little luck. Happy Collecting!